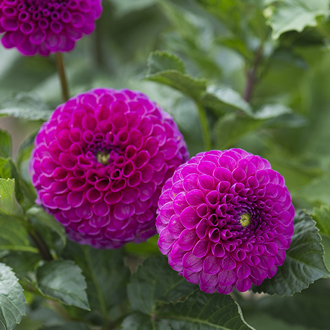 A deep pink/purple ball headed dahlia with blooms approximately 8cm in diameter. Stars of the summer garden. They provide both style and substance to border or container displays. Great value, they make excellent cut flowers - and the more you cut the more flowers they produce! At the end of the season tubers can either be lifted and stored or given a deep mulch before starting again the following year. Grow in full sun although they do tolerate some shade. Half hardy, perennial. Our tubers are all field grown, hand-picked and graded to ensure the best possible quality. They are supplied complete with full growing instructions.